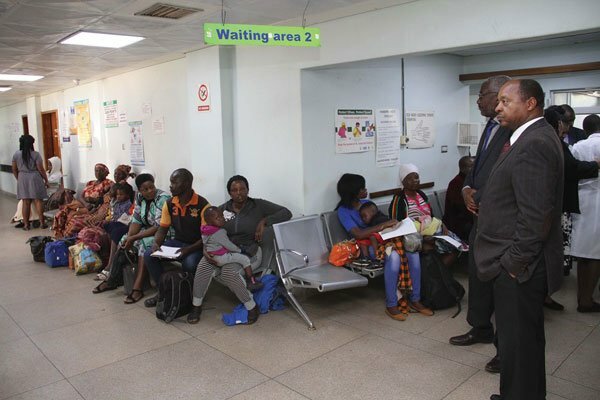 THE strike by doctors at public hospitals, which started last weekend, is set to continue after a meeting between Health minister Obadiah Moyo and the doctors’ representatives yesterday ended without an agreement while a meeting of the ruling Zanu PF party’s politburo ignored the growing crises in the country. Moyo and the doctors were locked in a meeting last night, the second of the day after the first in the morning failed to break the standoff. The doctors are protesting over pay, allowances and drugs shortages as the nation reels from a cash crunch, price hikes and shortages of basic goods, medicines and fuel. Sources told NewsDay that the meeting made inroads, but no decision was made, a development confirmed by a statement from the Zimbabwe Hospitals Doctors’ Association (ZHDA), which represents more than 1 000 members. The ZHDA added: “It is our understanding that they may try to victimise the leaders of the current strike, citing the same reasons. We, however, remain motivated in our course and will wait for them to come to terms with reality and give the situation the urgency it deserves. “We are aware of the effort of some of the former (ZHDA) leaders to bring the political card so as to influence the government’s position. We reiterate that as ZHDA, we are and will remain apolitical. Our grievances are genuine and motivated by the ongoing situation in our field. We will not tolerate those nonsensical useless agendas. According to the statement, the next meeting is scheduled on Tuesday next week. “We understand the timing of the meetings is in such a way that we lose patience. Such tools are, however, unfruitful as always, we will wait for them,” the doctors added. This is the second time this year that the doctors have downed tools over poor working conditions. On Monday, Moyo told Cabinet that he had engaged the doctors and they had promised to go back to work, but the doctors themselves issued a contradictory statement, distancing themselves from the pledge made by Patrick Mugoni whom they said was no longer an executive of ZHDA. Moyo yesterday started negotiating with the ZHDA’s interim leadership led by Elias Muzoremba. In a related development, the Zimbabwe Government Radiographer Association (ZiGRA) yesterday issued a notice to join the industrial action. “As Zimbabwe Government Radiographer Association, we regret to inform you that we have reached a conclusion to engage in an industrial action with effect from the 6th of December 2018. We will not be discharging our services to the general public nationwide,” ZiGRA said in a statement. Zanu PF’s politburo, which met yesterday failed to discuss the strike or the worsening economic situation or the fuel crisis and focussed on the party’s annual conference which starts next week. Addressing journalists at the party’s headquarters, spokesperson Simon Khaya Moyo (pictured) said they did not touch on the issues but that President Emmerson Mnangagwa had urged people to obverse cleanliness and must dedicate every first Friday of the month as a day of cleaning-up. “Every first Friday of every month, both the public and private sectors will take to environmental cleaning around the workplaces for two hours from 0800-1000. This was effectively emphasized,” Khaya Moyo said. On the conference, Khaya Moyo said preparations were at an advanced stage. “The chairman of the party Cde Oppah Muchinguri gave a comprehensive report on preparations the 17th national people’s conference. Khaya Moyo said the political commissar, Engelbert Rugeje, gave a report on the thank you rallies, while Agriculture minister Perrance Shiri spoke on the possible drought. The secretary for administration, Obert Mpofu gave an update on a meeting of revolutionary movements in the region that was recently held. Meanwhile, at Parirenyatwa Group of Hospitals, the outpatients wing was teeming with patients, some on stretcher beds waiting to be attended. Nurses and some senior staff were clearly overwhelmed by the patients who became more agitated when they learnt that the Health minister Obadiah Moyo was on tour of the facility. “We have been here for the past three days but no doctor has attended to us. We do not blame the staff, the government should resolve their grievances as a matter of urgency so that we get assistance,” Jacob Cherera, who had brought his elderly mother, said. The patients and relatives demanded to see the Health minister so that they could express their concerns.